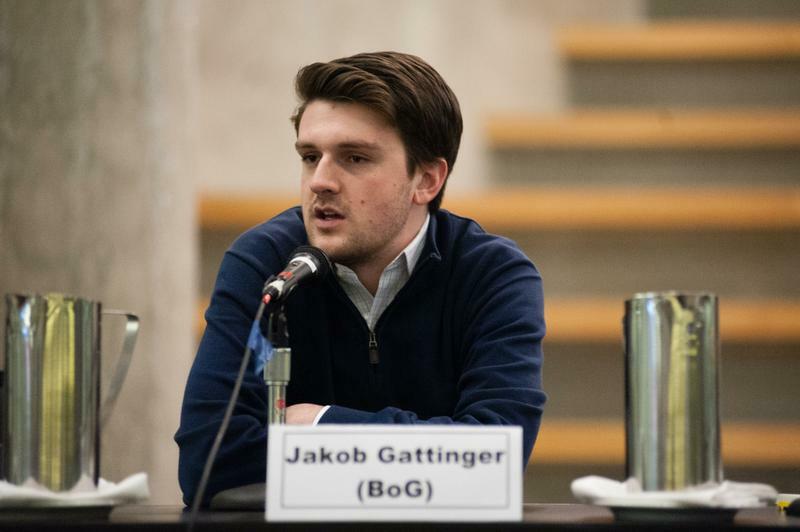 During the Great Debate, unchallenged incumbent Jeanie Malone and newcomer Jakob Gattinger got the chance to bring up their key concerns with the portfolio and the coming year. Given the blandness of their first debate, this was an interesting look at the less-discussed aspects of the Board of Governors student member experience. The debate opened with a hard question for the candidates: what is their biggest bone to pick with the administration? Gattinger was firm in his response. “Administrators do not take the Senate seriously. Administrators do not even call the Senate by the right name.” He explained that one of the key reasons that he decided to run for the Board was because of his frustration with Senate, including its sluggishness and propensity for bureaucracy over getting things done. Also regarding Senate, Malone added that she grew annoyed with the lack of follow-through, even based on clear directions from Board. The next question asked the two uncontested candidates about transparency of the Board — in particular what they think of it as it stands and how they hope to foster it. Malone said she has been satisfied with every decision made in closed session this year, as well as the rationales behind putting those discussions in closed session. Gattinger suggested community engagement as a great way to foster transparency and “challenge the thinking of the Board now and then” — he sees this coming to fruition through community membership on a Board Indigenous committee, for example. Candidates were also asked which policy they thought was the most important in the past calendar year. Both pointed to Policy 131 — UBC’s sexual misconduct policy, passed in April of 2017. But they raised massive concerns with its implementation and noted that improving that implementation as well as the language of the policy itself will be a priority in the year to come. A candidate-specific question aimed at Malone asked her whether she had opposed any tuition increases during her time at the Board, and whether she planned to do so in the coming year. “I have not proposed alternatives to tuition as a revenue stream as of yet,” she said. She then said that the Board is in the process of looking at other solutions, such as changing the structure of continuing student tuition so that those students would pay the same amount for all of their years at UBC. Gattinger, in turn, was asked whether he would have voted against the tuition increases. “So I think this year’s student Board reps made it clear during the discussion that there needs to be moving forward a specific explanation to the students who provide constructive feedback as to why their suggestions are not valid in light of the tuition being increased,” he said. This year, the Board received approximately 1,800 submissions of feedback from students, almost overwhelmingly opposing the tuition increases and explaining why. Gattinger is advocating for a response from the Board to every student that contributes feedback. Correction: a previous version of this article said that Malone was satisfied with the rationale behind closed-session decisions, rather than just the rationale for having those decisions in closed session. The Ubyssey regrets this error.